A stylish update brings warmth to the great room of a 30-year-old Colorado log home. An interior designer takes on the log home makeover of Windmill Meadow Ranch, a 30-year-old log home in Colorado. By Jason Lenox I remember the feelings of possibility and excitement when I first saw the great room at Colorado’s Windmill Meadow Ranch. I had been retained by its new owners, John and Susan Amis of Dallas, Texas, to assess the entire project and provide solutions to some specific design dilemmas. 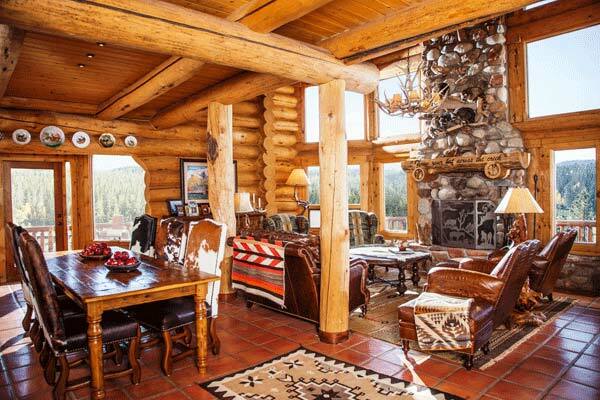 The couple who bought this 30-year-old Colorado log home hired interior designer Jason Lenox to re-do the interior. The 3,000-plus-square-foot custom log home was approaching 30 years old, had never been updated, and warmth within the new design and feel was essential. This log home makeover was full of challenges that brought several distinctive design opportunities. At the center of the house, as is often the case, sits the great room. Rough-hewn log beams and a floor-to-ceiling stone fireplace dominate the room. Natural light floods the space from windows on almost every wall. A great room in every sense of the word, it required planning and skill to bring it to its full potential. The owners wanted the great room to seat as many people, comfortably, as possible. They also wanted the space to have color and texture. The room was divided in an awkward manner, with log support beams that could not be moved. The logs provided a nice division between the great room and the dining room, but they also limited what we could do from a furniture placement standpoint. We decided on a classic seating arrangement, with two pairs of chairs facing each other and a small sofa facing the fireplace. Comfort was important, especially to John; he wanted people to sit down and never want to get up. One set of chairs was upholstered with embossed crocodile leather with ottomans to match. The ottomans serve double duty as extra seats that are easily moved around the room. The second set of chairs were salvaged from a resale shop in Dallas and re-upholstered in the classic Harding Sage fabric from Pendleton. The ottomans were covered in the same material and also serve as additional seating. The vintage chairs provide a spot of color and help give the room some historic personality. The small sofa was custom ordered to fit between the support beams in the room. Covered in rich brown leather with a subtle paisley tone-on-tone texture, it’s the perfect place to soak in the views this magnificent room provides. A round walnut coffee table fills out the center of the group and is accessible from all seating spaces in the room. The room is anchored by a 9-by-12-foot flat woven rug with earth tones and dashes of color. The room already had an antler chandelier that did not need to be replaced. Repurposing can save thousands of dollars and free up design dollars that are better spent elsewhere. New shades and a gentle cleaning gave the chandelier new life. The other lighting in the room consists of a vintage root floor lamp, a cast deer statue table lamp and an antler floor lamp. An aerial view of the made-over great room. Adding color became essential as we looked for ways to bring warmth and history to this log home. Susan fell in love with a collection of Navajo rugs from the early 1900,s. The rugs lend a sensible dose of pattern and color and also have a unique textural quality. We placed the rugs throughout the house, mostly on walls and across furniture. Pendleton blankets continue the color story and give the owners and their guests something to wrap up with on cool nights. The addition of the Navajo rugs, as well as the Pendleton blankets and fabrics, really brought this room from sterile to inspired. A salvaged chair reupholstered in Pendleton's Harding Sage fabric. The custom dining table was made from distressed walnut that appears antique. John and Susan wanted something unique for the chairs and after much discussion we decided on a herd: Each of the eight chairs is covered with a different cowhide. The seats are all upholstered with the same rugged brown leather. A chandelier over the table would have blocked views from the kitchen. Instead, we opted for a row of adjustable recessed lights in a row over the dining area. They provide light for dining, as well as accent lighting in the later evenings. A collection of vintage Bavarian plates depicting mountain wildlife hangs over an alcove leading to a side door. An original painting by noted Utah artist Eric Wallis hangs over a sideboard at the end of the great room. The sideboard serves as extra storage, as well as display for prized family photos. In front of the sideboard and next to the armchair is a vintage English game table that we used as a side table. The table dates from the late 1800s and blends seamlessly with the newer pieces in the room. Mixing new and old can help give rooms a true sense of place, and that’s what we were looking to accomplish in this home. Jason Lenox owns Antèks, an upscale rustic home furnishings and accessories store in Dallas. Antèks offers custom upholstery, interior design services and a line of Lenox-designed Navajo-style silver accessories under the J. Alexander label. For more information, go to www.rusticinteriordesign.com or www.antekshome.com.